George Graham Reviews Eddi Reader's "Simple Soul"
Most of today's pop music records, especially those on the large multi-media conglomerate record labels, seem to be constructed more like a government building project than a performance, with each and every musical part evaluated and perfected until it meets specifications, and fits exactly the what the higher-ups have legislated. So periodically music will go through fits of getting back to the roots, and that usually means going to the opposite extreme in the alternative rock world of bad musicianship, worse recordings and sophomoric material. This week, we have the best of both worlds, an informal recording, literally made at someone's house, with outstanding musicianship, very appealing songs, and vocals of uncommon beauty. It's the new CD by British singer-songwriter Eddi Reader, called Simple Soul. Sadenia Reader was born in Scotland, began playing guitar as a child, busked on the streets of Glasgow, and eventually became a backing vocalist for the early 1980s New Wave band Gang of Four. She continued to work as a backing vocalist, including for the Eurhythmics, then formed a short-lived but memorable band called Fairground Attraction, which had a number-one hit in England and drew some attention here in the US. The band eventually fell apart when Ms. Reader set her musical career aside for a while in the face of family demands. But she began a series of solo albums with a recording that included two sons of the legendary Ewan MacColl and Peggy Seeger, and was originally to be a band called The Patron Saints of Imperfection. But that record became a solo album for Ms. Reader which was released under the title Mirmama. Other solo albums followed, including an American-made eponymous release, and the superb 1997 CD Candyfloss and Medicine, which was one of those rare albums that combined a melodic pop sensibility with tasteful material, centered around Ms. Reader's elegant vocals. Now she is out with Simple Soul, which was a deliberate effort to create a more stripped-down, acoustic sound. The idea came about, according to Ms. Reader, when she went to visit former Fairground Attraction drummer Roy Dodds, "for tea and croissants." In her words, "We wanted to try my new recording equipment mixed with his new recording equipment." Ms. Reader had been writing with Boo Hewerdine, another talented British singer-songwiter who was once a member of a band called The Bible, and with whom she had worked previously. They set up their gear in Dodds' house and eventually recorded 27 songs, of which Simple Soul is a part. While the recordings they did were originally intended to be demos, it became apparent that the results were capturing a special spirit and feeling. So they decided to use the basic recordings, adding parts and editing, and the result is Simple Soul, a wonderfully engaging recording and one of the best of Ms. Reader's career. This CD has some of the same participants as her Candyfloss and Medicine album, including, Hewardine and keyboard man Teddy Borowiecki, who has worked with k.d. lang. While Boroweicki goes in for a rather wide variety of keyboard sounds, the CD's overall sound remains dominated by acoustic guitars. Ms. Reader's vocals in some ways are reminiscent of those of Ms. Lang, with her clear tone, extraordinary control and sense of classiness, even when she is doing songs that take a pop direction musically. And Ms. Reader's songwriting on the album, most of it in combination with Boo Hewerdine, is also first-rate, with wonderfully tuneful, almost delicate melodies providing the setting for some interesting and thoughtfully poetic lyrics. About the only track that falls short is one called Eden. Some of the rough edges of the demo nature of the recording become evident. 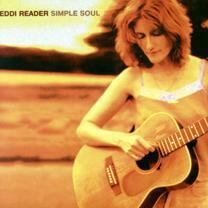 Simple Soul, the new recording by British singer-songwriter Eddi Reader is a wonderful example of how stripping away pretence and excessive studio slickness can make for a wonderfully honest and very appealing record, especially from someone who has been along the pop route before. This collection of fine, almost achingly melodic songs, with very tasteful, mostly acoustic backing, and Ms. Reader's superb vocals, is the kind of album one could easily get lost in. From a sonic perspective, the CD is also first-rate. About my only complaint is that on some of the songs, the recorded vocal sound is not as transparent as it is on others, but that may well be due to the use of the original demo vocals. But the mix is very good, and the dynamic range is better than most contemporary pop albums. Ms. Reader initially thought that the up-close-and-personal sound, with a minimum of production was going to be "scary," but she came to realize that the simplicity of sound is what she was indeed after better to communicate her songs. The result is a real highlight of her career.